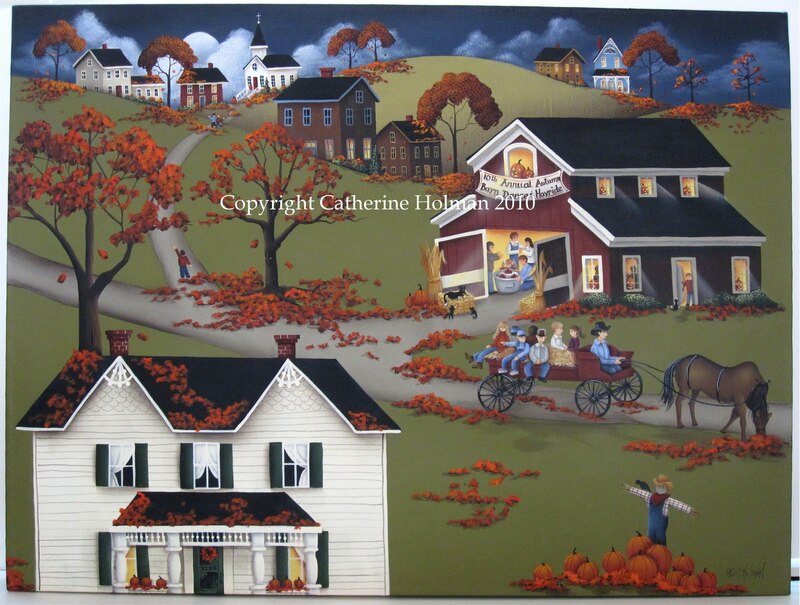 Catherine Holman Folk Art: Yeah! A Giveaway!! 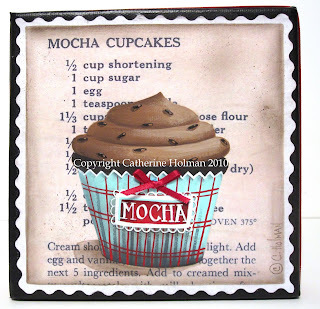 A worn and stained recipe is the background for this coffee flavored mocha dessert. Milk chocolate frosting also flavored with a hint of espresso is swirled on top of the cupcake. Chocolate sprinkles add the finishing touch. This yummy creation is wrapped in an aqua and red paper liner. A tiny red bow is glued to the cupcake and a red and white dotted ribbon is wrapped around the edges. To win this little "calorie free" piece of artwork leave a comment on this post. I've had a lot of people ask me how to do this and you simply proceed to the end of this post and at the bottom it will have a tiny link that says "comment". Just move your cursor over the word comment and click. Please leave me your email address if you don't have a blog link or I won't be able to contact you. If you don't leave your email address, I will have to draw again and go on to the next person. Your email will only be used to contact the winner. I don't share or sell email addresses. For a second chance to win, link to this post on your blog or facebook and then come back and leave another comment letting me know you have done this. For a third chance to win, become a follower here or on facebook and then leave another comment letting me know. If you are already a follower comment again to inform me for another chance. Deadline is Oct. 1st. I will announce the winner on Oct. 2nd. Guess what else? I've finished my fall painting and it's now up for bid on ebay. "Annual Barn Dance and Hayride"
The “10th Annual Autumn Ban Dance & Hayride” is in full swing at the Morton homestead. Karen and Howard look forward to entertaining friends and family with a hoedown in the barn each fall. Their three strong sons, Rickie, Jerry, and Bob, help their father prepare the day ahead by carving pumpkins and placing hay bales inside the barn for seating. Jack o lanterns glow from the windows guiding happy guests to the large red barn. Mom spends the day making huge kettles of chili and a hearty beef stew to serve to her guests. She always has an appetizing meal spread out on picnic tables covered with country red and white checked table cloths. Kid’s eyes glaze over at the sight of candied apples, popcorn balls, cookies & pies. Lucy, the Morton’s daughter, serves up a pretty smile along with some hot spiced cider to the boys standing in line hoping to ask her to dance. No one goes home hungry after this party! The children enjoy bobbing for apples and hayrides while moms and dads swing their partners across the hay strewn dance floor. Effie, the family cat and her new babies watch the entertainment from a hay bale outside the doorway and try to stay out from under foot while one of the kittens tries to sneak in the side door. Every year the party tends to grow as news spreads throughout the village about this fun filled event! I love this cupcake painting you have done it again! You always amaze me with your talent..
Its me again, I posted about your giveaway on my side bar.. When is the deadline to enter?. Enter me please! I love your paintings, wonderful and yummy as always! Oh this is soo adorable,please count me in. I often visit your blog nearly a year. I love your art works. I would like to thank you for sharing your works with us. May be one day I'll do nice things as you. I would like inform you that at this stage I have not any blog or website.But, I will be very happy if you enter my name for your giveaway.I'm sending all my best wishes from Turkey.God bless you. What a sweet painting! I love it. Congrats on 200 followers! Of course, I am one of those followers. Have been for quite a while. And I am very lucky to own a couple of your beautiful paintings! I posted and I´m follower, count me !!! love..love from Argentina !!! Ahhh, you got those dancers in there in your word picture. I know that I always tell you that I love the story that complements the painting. Congrats on 200 followers! I'm happy to be among them. What a wonderful way to celebrate with Mocha Cupcakes! Ackkk! I was shocked to discover that I wasn't following yet. Oh well, I'm 201 now! Count me in. 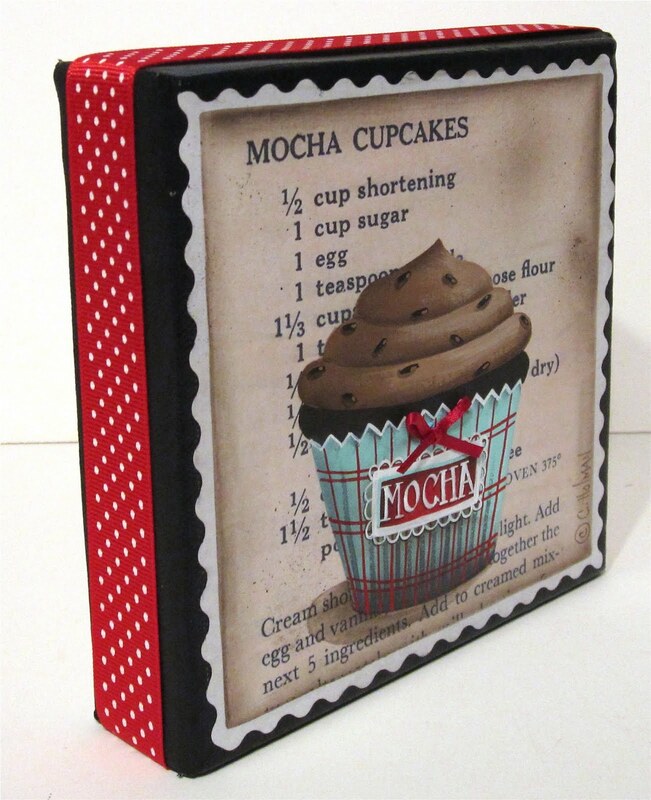 Love to have another one of your cupcake paintings! What a lovely, romantic work !!!! Best regards from Greece ! What a wonderful painting! Your painting is beautiful! I am a follower too! Oh boy! Count me it! I love this! I have the perfect spot for your beautiful art!!! Thanks so much...but I don't see a place to put my email address. Can you let us know where to leave it please? I love your blog..and your paintings are amazing! Thank you! Hi Cathie! Please enter me in your giveaway! I also posted about the giveaway on my blog! Thanks for having this giveaway! calorie free and beautiful artwork to boot! I could sit beside it while sipping my mocha coffee! What a fabulous giveaway, Cathie! I love it. Congrats on your 200 followers ~ wow! I'm a follower too. I'm a follower, Cathie, for quite sometime! I would love to win this sweet painting!! Thanks for offering a piece of your talent! Mmmmm I love your calorie free cuppy cakes! Hi Catherine, I'm Anna from Barcelona (Catalonia, Spain), I love your painting. I bought some of your books and I like a lot to paint as you do! I would like to thank you for sharing your works with us. I will be very happy if you enter my name for your giveaway. Ok, please put my name in the hat for the wonderful cupcake! P.S. I was able to get your book from Amazon. I love it!!! I'd love to win the painting! 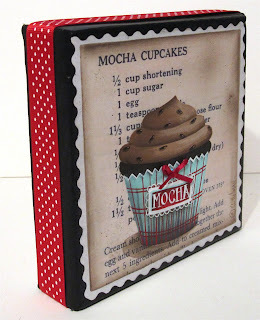 Now I have to go find a recipe for mocha cupcakes - the painting has made me hungry. I couldn't find a spot for my e-mail. I am a new follower and I love your art. I think I gained a pound just admiring your cupcake. Please add my name to the list. What a wonderful little painting! This would be lovely in my little farm kitchen...thank you for giving us a chance to win it. Take care. I just saw that I could do this again if I was a follower...well I just became one earlier this morning! Loving your blog. I need calorie free cupcakes!!!! Lovely paintings! I haven't been over to visit in awhile. Please stop by my blog as I'm having a give away too! I would love to be considered to hang this delicious looking piece of art in my home. Congratulations on reaching 200 Followers! Love ALL your cute cupcake paintings.